Rural Revolution: Welcome to new readers! I seem to have a lot of new readers all of a sudden. Welcome! Perhaps you'd like to know a little more about us. 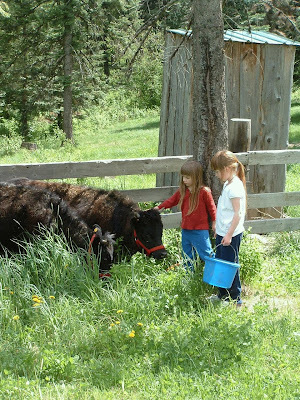 We are a family of four living on a twenty-acre farm in north Idaho. That photo on the masthead? I took it from our front yard early one morning a few years ago. It gives you some idea of the kind of terrain in which we live. This is farming country, and I'm proud to call many farmers our neighbors. 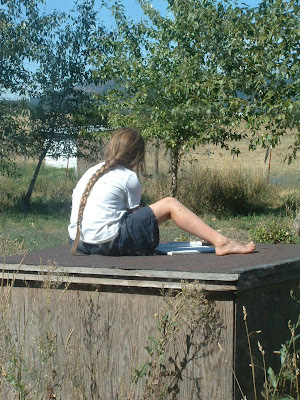 We like to say we're doing the three H's: Homesteading, Homeschooling, and Home Business'ing. By homesteading, we try our best to be as self-sufficient as possible in terms of growing our own food. It's hard work - trust me. We raise Dexter cattle, which are a dual-purpose (milk and meat) breed and we put a steer or two in the freezer every year. We also have a Jersey cow, and through her generous output over the last couple of years I've learned to make all manner of dairy products such as cheese (mozzarella, cheddar, and cream cheese), butter, yogurt, etc. We also keep chickens for meat and eggs. We're in the process of putting in a wheat field. We garden and raise fruit. By homeschooling, of course it means we homeschool our kids. We have two daughters ages 15 and 13, and two finer young ladies can't be found. (Okay, maybe we're biased.) We strongly feel it is our responsibility to raise and educate our children and train them up to be decent, intelligent, moral, respected members of society. So far so good. By home-business'ing, it means we have a home business which has been virtually our sole support for eighteen years. We make hardwood drinking tankards. Like beer steins, made of wood. (Hey, someone's got to do it.) Before anyone asks... yes, at last we have some retail tankards available. You can see our selection by clicking here. We're a fun-loving, close-knit, somewhat goofy family who is happy as can be to live out in the country. Oh, and lest we offend anyone right away, you should know we're politically conservative and Christian as well. My husband insists I mention that I'm a columnist with WorldNetDaily.com and RegularGuy.com. I write a monthly article for The Crafts Report Magazine, and I'm a regular contributor to a number of rural publications (Backwoods Home, Backhome, Grit, Countryside, etc.). I welcome you to read about our triumphs and failures, our successes and screw-ups. Not long ago a neighbor commented that this is one of the most honest blogs she's ever read... and since she lives nearby and knows us very well, she ought to know. What she means is, we tell the plain unvarnished truth of life in the country. The good, the bad, AND the ugly. I thought that was one of the nicest compliments I'd received in a long time. So pull up a chair and set a spell. I hope you enjoy your visit. Thanks so much Patrice for filling we newbies in. I just subscribed yesterday and I know I am going to enjoy your newsy, interesting blog. Love the photo of your place. It's breathtaking. I'm also one of your newbies, so thank you for the introduction. I already knew that I liked your blog, but now I like it even more since I "know" you better! It's so reassuring to discover that like-minded people exist in this world. It sounds like you are living the same kind of life as my family - homeschooling, trying to be self-sufficient, raising our children in a conservative Christian home, only we are in the rural south instead of in Idaho. Our dream has always been to one day relocate west to an area with more families like ours. I'm interested in knowing if you have always lived out there, or if you relocated to your area. We've lived in Idaho for seven years. 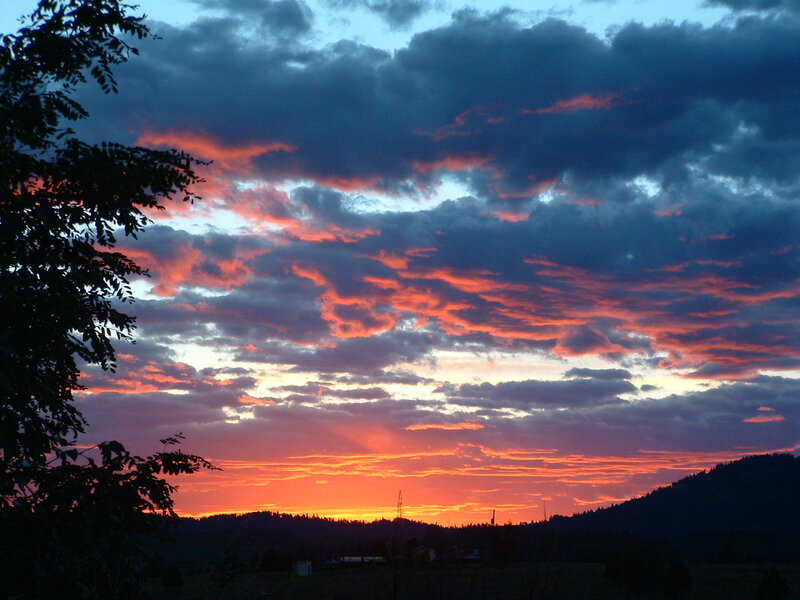 Before that we lived for ten years in semi-rural southwestern Oregon (just north of Medford). Before that (yuck pitooey) we lived in the Sacramento, CA area. We've spent the last couple decades slowly migrating north. We're not hot-weather people and I simply cannot handle heat, so the cooler climate of north Idaho suits me *much* better. It all started yesterday, when I searched "Tattler lids" on HomesteadingToday.com. The link to your description was posted, I got sucked into your blog, & have been reading every chance I get for the last 24 hours! :) I've made it back to this post (so far) & thought I'd say hi. I had an "ah-ha!" moment when I was reading the "my life" section of your website. I kept feeling like your pictures seemed so familiar, then I read about your article being published in Countryside. Ah-ha! I remember your pictures & your story! It all came back to me. My husband & I are living near Portland, OR, saving up to buy our glorious chunk of forever land. It very well may end up being in your neck of the woods. We have family in Spokane, can't afford land in OR, and fear this area becoming completely Californicated. I think our homeschooling libertarian family would fit in well in ID & have long fantasized about it. Welcome, Aubrey! We hope you'll be a neighbor soon. I wrote for Countryside for about two years. What a fabulous editor Anne-Marie Belanger is! If you do end up in our neck of the woods, I recommend buying land in Idaho rather than Washington. It's probably cheaper, but at least for us the deciding factor is that the homeschooling regulations are not as tight as in Washington. We are freer to educate our children how we wish by living in Idaho. Good luck - stay in touch! Thanks, Patrice! I agree, homeschool laws seem much better in ID. I hear gun laws are better as well. And honestly, I am so goofy, I'd prefer ID simply because I don't want to live in the same state as liberal Seattle. lol Can you tell I am trying to escape? I'm not a newbie but this really helped to remind me about you and your life as I learn. Thank you for the new Welcome! What a nice bunch of new people! Well done Mrs! And it's good to see so many new readers discovering your site. Aubrey, as much as I'd like to have you for a neighbor, I think you're taking a wise approach to your northward migration when you look to bypass Washington for Idaho. I live on the northern edge of the peninsula, where it's stunningly beautiful and the neighbors are few and mostly conservative, but the fact remains that we're a state that, for the time being at least, is utterly dominated by, well...let's call it Seattle politics. UGH. But for us it was a good choice, as my husband was born and raised here and his folks are thrilled to have us nearby. And I was so grateful to escape the nightmare that my native home of California had become that I can honestly say, blue and liberal police-state politics notwithstanding, it's great to be here. If it weren't for the home schooling issue I'd say come here and help us take our state back, but in all truth, Idaho would likely be a better choice for your kids' sake. Golly, after reading all the hate speech about California, I think maybe I should not come here anymore. Snivel, snivel. There are millions of Californians who think as all of you do, but we are outnumbered by liberals and morons. I say "morons" with all due respect, mind you. Fact is, most of the liberals in this state came from some other state or some other country. We conservatives have tried to stop that trend, but we couldn't. So, we do the best we can under the adverse circumstances. Another couple of facts so you will better understand our situation: 55% of the population is comprised of "minorities" and 20% of the population was not born in the USA. If the "minorities" make up the majority, are they still considered minorities? Yes, according to the Federal & State governments. And therefore they can get many benefits and exceptions that the rest of us can't or don't get. My hope is that you folks will not forget about the conservatives living in California and how difficult it is to be a California conservative. Please pray for us, don't hate us. Thanks, from a 4th generation Native Californian of the rightwing kind. I stay in my state because I want to restore it to greatness, I will not abandon my once-Golden State. Patrice, your new Welcome Button is another great feature of your blog. Nice work. One question, though, why no pigs? Get some pigs, I've got a hog-scalding pot if you want it. Just let me kmow (and tie up the dogs) and I'll be there next June, delivery free of charge and so is the hog pot. Patrice, Please watch this when you get time. I am subscribed to your RSS feed. Thanks for what you do. Thank you and may God bless your family. Welcome Cleber! I'm delighted to have a reader from so far away join us! Good luck in your journey toward simplicity, a subject that is near and dear to my heart. I was wondering if you had a place to sign up to receive emails of your blogs? Thank you for your honest, truthful commentary. I enjoy them immensely. Keep up the good work. I want to bless you as you have blessed me with your articles. Thank you Peter! And welcome. Greetings from an opinionated housewife in England. Great blog! If only we had some men of backbone in our legislature to stand up like this gentleman! Hello from a fellow rural Idahoan, somewhere between Priest River and Spirit Lake. I found your blog via a forum where someone posted your garlic thread. Homesteading is a slow process. Never enough time or money. It's an ongoing process. Made ever more urgent via the actions of our government. Hello, fellow Idahoan! Glad you found us. Hello, I found your blog this evening and can relate to your conservative politics and Christianity - a doubly politically incorrect position these days. My wife and I had homeschooled our 2 boys (13 and 11) through 5th grade for the same reasons. We also live in the country, although close to town in Illinois. I have been enjoying some of your blog posts. You have a really great site! I also read a few of your articles on WND and enjoyed them all. Keep up the good work! I will be reading more. From a Christian, Constitution loving, 2nd amendment promoting, Tea Partying, politically incorrect engineer. Gotta love those Christian, Constitution loving, 2nd amendment promoting, Tea Partying, politically incorrect engineers! Welcome aboard. Patrice, even I'm a long time reader, I just noticed your "welcome" page. Of course, after reading your posts for all this time, most of what you mentioned above was quite clear to me, but it was nice to have confirmation. One thing is for certain, you have opened my eyes about rural living and all the hard work it takes to make it successful. And based on all of your post, I would guess you consider you and your family successful. While my family and I could not be considered rural, we do live in a small town close to Puget Sound. I have taken some of Don’s advice about the “go-bags” and have started to build them. Very much in the early stages, but as a recently retired military member, many of the items he mentions were already on hand and packed, ready for a deployment. Now that I don’t have to worry about deploying half way around the world, I can concentrate those efforts for emergency purposes. Sounds like you're doing fine, Rob! Glad you found Don's advice to be useful. Seems to me, that all those kids in public schools are learning all the currently accepted values, and they aren't functioning so well in society. Maybe you should give this a second thought, but maybe it wouldn't do any good after all. I can answer that question. Your children will be just fine! My husband and I worked at Mt Rushmore summer 2009. The homeschooled children that visited were intelligent, respectful, very courteous, interesting to talk to & interested in everything. They went directly to the bookshelves. History books. Can you imagine that! :) They were well spoken on various topics and more then willing to talk to adults. They were EXCITED about being at Mt Rushmore and about learning. I was totally impressed with the character of the children that came in that were homeschooled. And I have to say that I was unimpressed by a great number of the other children that came in. All I can say to all of you homeschooling parents - WEll DONE. Keep up the good work. Another N. Idahoan ..new reader .. will be back to read more. Patrice, I just enjoy your blog and articles so much. You always express my own feelings, but much more eloquently than I ever could. :-D Love to have you for a neighbor, but I can't take those COLD Idaho winters. The coastal Washington rain doesn't bother me a bit! LOL! I just came across you blog. Fine job! It looks like we're neighbors. We live on 40 acres in northern ID too. Well I don't agree with the whole article becuse welfare does give peoplea place to live food to eat and free health andother insurance and just make babies and to get it you don't have to work or pay a dime. but as far as social security I have worked hard all my life and paid into social security so I think I deserve it unlike all these want to be americans the Goverment let come here and collect the american peoples money. One final thing don't you ever compare God to the trash in the government they are a disgrace to God but he will have mercuy on them if they ask for repentance. Aw, doggoneit Patrice! It's all your fault! I'm not new to your blog; I've been hanging around here for a while, but this seemed the most appropriate spot to drop this comment. I started a preparedness blog of my own a couple of years ago. (I'd give anything to say it was also about rural living, but alas, for now we are city dwellers. )Went like gangbusters for a very short while, but fizzled. (several reasons) But being an ardent fan of you and your site, I'm starting to get the itch again. At first I thought, well, Patrice has got this stuff so well covered (along with some of the other blogs she links to) what's the point? How much of this stuff can there possibly be room for? But I'm finding the comments I post on your blog are getting longer and more numerous. I'd like to think something I add might be of some benefit to you and your readers, but rather than "getting it out of my system" it just whets my appetite. As I'm sure you can attest, this is a simple fact of life for writers. So, I'm thinking of starting up again. I'll let you know what happens. And without question I will be adding a big, fat, prominent link to Rural Revolution! Jeff/Tucson, good for you...!!!! Keep up the good work. Welcome Charley! We used to live outside Gold Hill, which is about halfway between Medford and Grants Pass. In many ways we miss it but I'll admit the summer heat used to get to me (I'm a cold weather person). Good luck with your moving plans. Found Rural Revolution today, Easter Sunday, 2011. Orange Jeep Dad said it - HOOKED! Linked RSSFeed to My Yahoo top of page. Thanks for sharing the good, the bad and the ugly! Can't wait to start reading the archives! Welcome, Chris! Glad you found your way over to our neck of the woods. Greetings from NE WY. You GO Girl! Top notch communique! Found this blog via WND. I'll be back. What you share brings hope and balance in a time of decline. Humor and truth CAN go hand in hand...it's a simple thing that has been dismantled. Hi Katherine! Glad to have you aboard. As we talked about earlier, Alex and I would love to have you in for a book signing. From the bit I could overhear during your interview, your book sounds wonderful. I wish you all the best and look forward to reading more of your stuff here! Thanks, Devon! It was fun meeting you and Summer. I look forward to working with you. Just the place I've been looking for. Are there many farms such as your's for sale? If so, how does a fella go about inquiring about them? Are the farms expensive? I've been following your blog for a few months now, and just took the time to read your "Welcome". We are actually considering a move to Idaho, and would love to discuss a recent article, made known through a call-in Christian Talk show on CSN Christian radio. The person shared the article concerning China being interested in land in Idaho, and that China had already purchased around 30,000 acres south of Boise with plans to build industry and a self-sufficient city. Do you and your husband have any information regarding this, we cannot tell if the author of this article is just an alarmist or what? The whole "idea" that China is "buying" Idaho sounds a little out there. Do Idahoans have concerns over this, or is this man inflating a situation that is just normal, for example, there are other foreign companies w/ industry in America, is this simply the case here? Or something more? If you have any insight we would greatly appreciate it. I have a link on my blog where I can be contacted privately if you have time to respond. 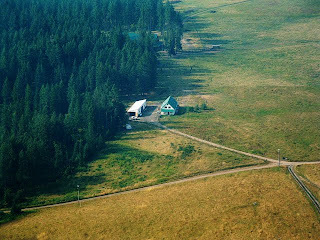 I do not believe the info regarding China owning land in southern Idaho is "alarmist" in the sense that I've heard the same thing from reputable sources. We're in north Idaho and frankly get most of our news from over the border in Washington (specifically Spokane) so I haven't heard much from mainstream sources about this (nor, frankly, are mainstream sources likely to address it). There are anti-Constitutional things going on everywhere. Despite the issue with China, Idaho is still considered one of least regulated states and has an enormous amount of people who believe in personal responsibility and individual freedoms. Just something to consider. Let me know what happens! To begin with what is a url? Now Don Lewis your answer to alex was totally not out of hand,more stand up and tell it like it is needs to happen.We too own a small farm in Wisconsin and work at non farm activities to make some cash. I'm only 19, but my uncle showed me your blog a couple weeks ago. I very much agree with everything I've read on here, and I appreciate everything you post. Welcome Troy! I'm pleased you found us. I believe the article is written with the intent to make us feel sorry for all of those in poverty. However, it had exactly the opposite effect on me - I am very sorry to say. In all but one of the stories I was able to find at least one, if not many, examples of what you define as poor choices leading to bad things. What I am likely to do with the article is to print it out and share each story with my children and see if they can identify the poor choices. There's the risk of making them insensitive to real needs, but I hope that in actuality it will help them identify how to help people out of these messes in EFFECTIVE ways. This is just another example of our not educating the next generation in ways that really matter. It makes me SO ANGRY that people end up like this and seem to be utterly unaware of how it happened. And now we've created a whole generation of people who don't know how to pass the right choices on to their kids. If people made good choices then we could concentrate on helping the people who truly had random bad things happen to them. And why have I had to become so bitter? An interesting read, Anon 10:34. The "elephant in the room" no one wants to see is to what extent long-term poverty is caused by poor choices. I'm not talking about temporary setbacks such as unemployment or medical difficulties. Those happen to everyone. But long-term chronic poverty is frequently caused by making bad decisions -- having children out of wedlock, doing drugs or alcohol, having a bad work ethic where people show up late, dress inappropriately, etc. That said, in this economy I have a lot of compassion for those who are struggling. Much of the economic buffeting people are experiencing is caused by winds of change far beyond anyone's personal choices or actions. The best we can do is hang on for dear life. Googled, "canned bacon" and found your web site. It is great! I put in favorites. Thank you and welcome, Mike! Found your site last year via Survival Blog and now can't let a day go by without checking to see what you and your beautiful family are doing.I also canned bacon bits after your article, would not have thought of them on my own !Keep up the great work and don't let the trolls get you down . I don't know if you have ever heard the story of Johnny Lingo and his 8 cow wife. Our pastor shared it with us during our online bible study yesterday. I thought you might like it. Here is the link. Good Job on your Book. I check you blog everyday for new info and pic, Barn sure looks good, I also follow you friends blog Enola Guy. Thank you, Carlos! Glad to have you as a reader. We've been working some more on the barn, I'll post some pix shortly. I am so excited to have found your blog! It proves to me that my dream in life can be a reality, it gives me hope! Welcome, Katie! I'm glad you found us. Add this to your fashion reviews....it is a hoot! I found another hot fashion item for use around the farm while playing basketball. I am sure many of your readers will be on the waiting list for this one! Anyway, today only (I think?) an interesting looking kindle book is available from Amazon. It is entitled "Farming as a Spiritual Discipline" and is by Ragan Sutterfield. He has a few blogs also. I have not read the book but I downloaded it today to read on my computer later. I though possibly you or your readers might find it interesting. Just found your blog today. What good fortune! Hubby & I have spent quite some time deciding where to "make" our home. Just this week we (finally) made the decision of that Idaho is the place for us. We are now just comparing certain locations for our final landing spot & will be heading back to Idaho later this month to check out the outskirts of the CDL area. Your blog has appeared in our life at the perfect time! It's a little dry and brown this time of year since we haven't had rain in a month, but I think you'll find it beautiful nonetheless. Happy hunting! Glad to see you found your way here, Alicia. Now start a blog and document your progress, hear? Yes Ma'am, I will. Have a great weekend! I started following your blog early this year. My wife and I have learned quite a bit just reading your entries. We live on the eastern slopes of the Sierra Nevada's in the high desert. I see you would rather avoid the kind of heat we have here. My wife misses the afternoon rain showers she was used to in the mountains where she's from. I've started a wordpress blog and would like to follow you there. Not sure how that's done though. Any ideas? I've added you to my link exchange (reciprocal linking is always appreciated). The link exchange operates on a scrolling basis in which blogs with the most recent posts scroll to the top. So to stay visible on the link exchange, I urge you to post frequently. Your blog is lovely so far, I wish you luck! Thank you. I will reciprocate. Found your site through another blogger, and I believe it was through Lisa Bedford's articles that I found you. You site has made me laugh, especially when it comes to canning. Only those of us who take the time to make the mess understand the reward. Enjoying all the different articles you have posted. I met Lisa in May when we were both speakers at a preparedness expo in Colorado, and you never met a nicer person. Just became an instant fan! I am in northern Idaho as well, Lewiston. We have been preppers for awhile now, just became very serious when we bought the "anti zombie tank" huge 1969 motor home last summer. I am interested in dehydrating my own food and am a constant learner in the art of being prepared and aware. Currently looking into building my own solar panels among other stuff. THANK YOU for such an informative place to learn! Welcome, Mindy! Glad to have you aboard. I have your book, The Simplicity Primer, in my bathroom and read a page while doing what needs to be done at the time. I just discovered you have a blog...noted on the back cover! What a great discovery! Welcome Lynn! I'm happy you found us. Some grew, most didn't. I suspect the ones that didn't were mostly due to birds -- robins have a bad habit of plucking the tiny fresh leaves of new-growing beans, which dooms them. This year I'm going to net my beans when I start growing them. Hi Patrice! I'm new to comments, have been reading the blog for about a month during down time at work & finally had a chance to log in on my home computer. I would love to be living your lifestyle. Have 4 1/2 acres in the west county of St. Louis, MO with 2 horses, 3 dogs & 4 cats. I'd have a cow and chickens but we're part of a subdivision that doesn't allow it. I may pretend ignorance of the "rules" though and get some chickens soon. I started a small garden this year & plan to expand it next spring. I love reading about your family doing the things I wish I was doing. Welcome, Jeanne! Sounds like you're doing an excellent job despite being in a subdivision. As the saying goes, bloom where you're planted. Glad you found our little cyber-home. Hi am a new reader also, although not sure how much I will read since there is no option for email subscription and no easy way for the few ways to read blogs either. So am at a loss. Thanks for looking into this if you do. I was really excited to find your vinegar project. Can't wait to make some berry vinegar from overripe blackberries. I am not a homesteader (except in one of my past lives)...more of a suburban hippy. However, I didn't get too far in reading before I was saddened and felt like I was back in a public middle school. I live in California and actually love the place...and may be considered moronic as some of my opinions may be considered too liberal. I will limit my future conversation and will simply thank you for your writing. I love your site. Just found it last week. Spouse and I just bought 10 acres in your state. Can't wait to flee California (orig. from Arizona). The goal is next spring. Have experience with rabbits, chickens and turkeys but look forward to trying a couple of beef cows next year. The house is little but the barn big. I want to print out ALL of your site but will keep it book-marked instead for future reference. Look forward reading your entire site. I live just outside CDA - glad to have found you. Welcome Clair! Glad you found us too. I just today discovered your blog from a friend's post on Facebook In January my husband and I moved from a town home in Southern California to a house on 20 acres in Northern Idaho. Our dream is to do exactly what you are doing, so I'll be sure to check in regularly! You might try Square Foot Gardening by Mel Bartholomew. It discusses how to start small but successfully. Hello. Just discovered your blog. Have been reading your articles in the Backwoods Home and really enjoying. We had bought a homestead in Idaho 20 years ago when I found I was allergic to everything there. Wound up in every ER between Orofino and Grangeville. So instead we wound up in Oregon's high desert on the east side in a very conservative region. My heart is still in Idaho. Welcome, Tewshooz. My husband winces in sympathy with your allergic reactions -- he also gets smacked pretty hard. The high desert sounds like a nice compromise. Is there anyway to subscribe to your blog? I can't find it. Over from Survival Mom - enjoying your podcast! Hello, I'm not very computer savvy and this is my first time on a blog. So, I'm not sure what is going to happen when I press "Publish" . I'm really interested in your post about the huge barrel that you put rice in. Could you tell me where you ordered the food grade plastic liner. I'm building a "water from air" thing using a 55 gallon container and a dehumidifier. I need something to line the container that is food grade. Thank you for all your helpful ideas. Thank you Patrice. Yes, they do have food grade liners just the size I need. But, they sell in orders of 50 count. I will contact them and see if they will let me buy one or 2. If anybody else knows of a source that sells food grade barrel liners, please let me know. Hello Patrice! I hope you are well. I'm writing because I've had one of your beautiful tankards for well over a decade and I absolutely love it. Unfortunately, it has just begun to leak out of the bottom. I'm wondering if there is any way I can re-apply a coat of the inner lining to seal it up again? Or can I purchase a replacement (thought I would be saddened to have to retire such an exquisite piece of craftsmanship)? Any help would be greatly appreciated. Thank you so much! Aaron, why don't you email me privately at patricelewis@hotmail.com so we can arrange to fix your tankard. I'm new to reading blogs. Thanks for doing such a great job. Just one question, how can I subscribe to this blog?